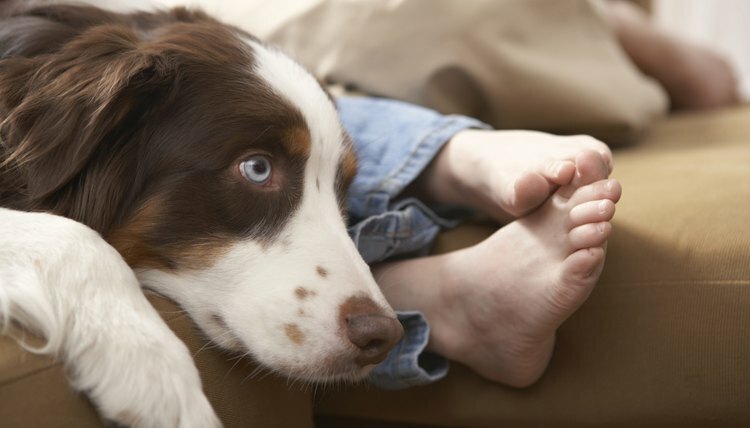 Pododermatitis, or inflammation of the skin on an animal's paws, is unpleasant and painful for your dog, but rest easy that it's also treatable. If you suspect that your dog's paws are infected or inflamed, take him to a veterinarian immediately. Only a qualified professional can determine the best treatment for your pup's footpads. Check your dog's paws. Are they swollen or red? Do they have sores, ulcers or masses on them? Do they feel as if they have fluid in them, or is there actual discharge? Does your dog limp or bite at his paws as if they bother him? If so, pododermatitis could be the problem. Only a veterinarian can confirm the diagnosis. Four basic factors contribute to pododermatitis: outside infections from parasites, fungus or bacteria; underlying health conditions such as cancer, thyroid issues or steroidal imbalances; injuries; and allergic reactions. If your dog's pododermatitis is a result of an infection, check his environment. Does he spend a lot of time in a wire crate? If so, that wire could be cutting his feet, creating an environment for bacteria to flourish. An overall dirty environment can lead to parasites or fungal infections. Chemicals or other irritants in your dog's vicinity can contribute to the issue. In some cases, pododermatitis is related to food allergies. When pododermatitis is diagnosed, your vet can begin treating the underlying cause of the problem and address the painful paws themselves. Thoroughly clean your dog's environment. If his crate is wire, switch to one that's plastic or rubber. If that's not possible, cover the bottom with a thick mat to protect the dog's paws. In the case of food allergies, try switching to a brand without gluten or high amounts of grain. If your regular food is beef-based, try one with chicken, or vice versa. Paw treatment depends on the type of infection. Your veterinarian might prescribe an antifungal medication or an antibiotic. Sulfonamides and chloramphenicol are two options. Your vet might recommend cleaning, soaking and bandaging the paws. Without treatment, pododermatitis can lead to painful swelling that causes permanent damage to your pup's paws. Be extra vigilant if you have a dog who belongs to genetically predisposed breed. Boxers, German shepherds, dachshunds, mastiffs and English bulldogs are among the particularly susceptible breeds. Veterinary Allergy; Chiara Noli, et al.